There is no frying pan, only fire. Three refugees make their way from war-torn Sri Lanka to France, banding together as a family even though they have never met. The father, Dheepan (Antonythasan Jesuthasan), is a soldier from the losing army going into hiding following the slaughter of his men and his family; the mother, Yalini (Kalieaswari Srinivasan), is hoping to escape to London and join her only remaining relative; and the daughter, Illayaal (Claudine Vinasithamby), is an orphan in the right place at the right time. Families have a better chance of getting through the immigration red tape, so these strangers will have to pretend they are tied together by marriage and blood. It’s a nightmare for many in Trump’s America, the huddled masses gaming the system, but then again, maybe a story like Dheepan will inspire some empathy. What would you do if your country went to war and you ended up on the wrong side, or worse, had no real stake in the fight and just got caught in the crossfire? Released in 2015, Dheepan is the latest from French director and Cannes-darling Jacques Audiard, who previously made a splash with A Prophet [review] and Rust and Bone [review]. Dheepan has more in common with the earlier movie--a prison picture about gangsters coping with life inside and outside their cells--in that the filmmaker manages to take very specific group sand relate their individual experience in a way that is true to their story but also relatable. The particular becomes universal. Once this lost trio lands on French shores, they are put into the system, which eventually sends them to a remote ghetto where Dheepan will work as caretaker, Yalini will care for an infirm old man, and Illayaal will go to school. As they learn to make their way in their new home, they also start to become a real unit, with the lure of traditional roles proving too strong to resist. They also start to learn that the world is terrible everywhere. The complex where they’ve been placed is run by drug dealers, and Yalini is unwittingly caring for the father of the local boss, Brahim (Vincent Rottiers), who himself is freshly out of prison, only to be trapped in the tenement by an ankle monitor. It seems for some people, circumstances never change: you’re always imprisoned, you’re always at war. The movie is called Dheepan, but I feel that’s misleading, it’s not entirely his picture. 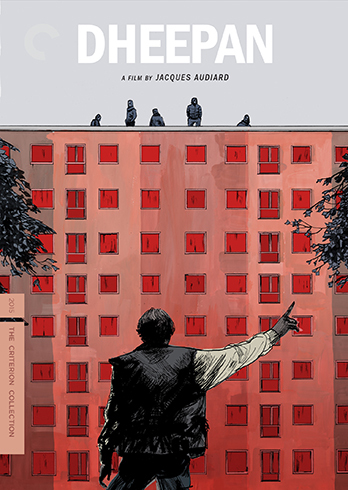 Sure, he gets an interesting arc, and becomes an active plot agent in the film’s powerful climax, as his past comes back to haunt him and he wrestles with his PTSD, but the true center of Audiard’s film, co-written with the director’s regular collaborator Thomas Bidegain and Noé Debré, is Yalini. She drives their scheme, searching out Illayaal in the refugee camp, and she has the most connection with the varying lines of action. 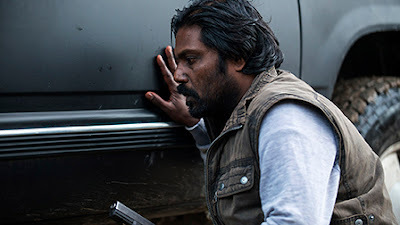 When Dheepan decides to fight back against the thugs, like some kind of 1980s vigilante, it’s Yalini who must shuttle messages back and forth between her husband and the bad guys. Likewise, as Dheepan loses his way, she is the one who takes responsibility of their adopted daughter, a task she has otherwise tried to avoid. (If anyone gets short shrift, it’s Illayaal, who kind of gets set aside after some initial hiccups at her new school; there’s more to be explored here regarding the young girl’s search for acceptance.) That said, both lead performers have a quiet strength that gives them equal footing. One can sense there is much going on beneath the surface of their words and deeds. In fact, that’s one of Audiard’s greatest strengths, hinting at and then ultimately revealing what is hidden. There is much going on behind all these stories, a history to each character, a politic to their situation. Audiard plays with light and dark throughout Dheepan, using visual metaphor to suggest truth emerging. In early scenes, it is literally lit objects appearing in blackness, the people carrying them or around them only becoming evident as the light sources--mouse ears, a lamp--gain power. Later in the movie, when too much has been revealed, we see Dheepan sitting in an orange light, fully exposed, but his own darkness still lurking within. For him, it’s secrets that are brought out; for Yalini, a strength and resourcefulness otherwise untapped. And a goodness. It’s a credit to the script that, despite a very exciting, violent finale, the climactic scenes don’t overtake what comes before. The grit and flow of this action reminds me of Cuarón’s Children of Men [review], for as much as Audiard is a master choreographer as for his assured hand. The confidence we see in these scenes is what keeps them from calling too much attention to themselves, even if they are the biggest and loudest moments in the entire film--at least on the face of things. Audiard’s real skill is that every quiet moment is still big and loud to him, and thus given as much emphasis. The silence speaks volumes, or even the lines he chooses not to translate, as his main characters jump between languages--Tamil, French, and a little English--it’s the tone of the words, the force with which they are said, the expression on the actor’s face, that tells the real story. And their emotional conflagrations are as powerful as any gunshot, their unexpressed rage as hot as any emotion.